My first live gig this year – expanding the Cork City Gamelan into Limerick – and the most enjoyable one since I started playing live again. I played the Waterphone under the baton of a very capable conductor: Alison “Little” Forbes is an artist and musician with whom I have been friendly ever since I first came to Ireland, but this was actually our first time performing together. 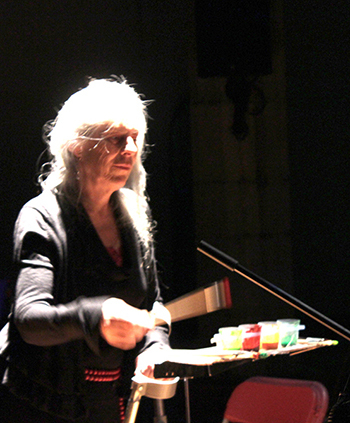 The performance was a “pretend concert hall event”, and Little was “conducting” with paint and brushes. Dance Limerick was perfect as a venue: a converted church with a real dance floor. Room acoustics don’t come much better than THAT. 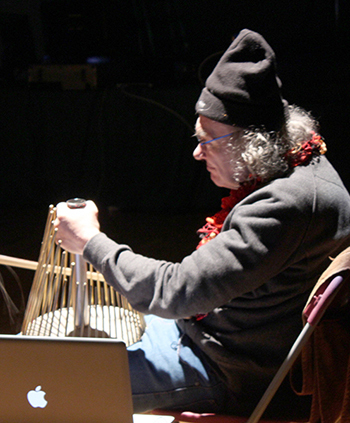 I had composed a graphical score for a “Concerto for Waterphone and Pigtown Scratchings”. On the day before the show, we used some gates and bins and things around the city to record sounds for making a backing track. Between one thing and a few others, we ran out of time, so I changed the second movement a bit. I left out the introduction and the coda … making it just one long improvised cadenza – that’s ok, things like this are part of the Spirit Of Pigtown Scratchings. What gives Pigtown Scratchings its unique character, its reason for existence, even, is the interdisciplinary All Stars Jam at the end. What an experience, to be jamming with a dancer and a storyteller … and Roger Gregg, one of the first people I jammed with when I first came to Cork … full circle, 30 years later! It was a great night – thanks to everybody for their generous help around all the difficulties we were facing. A special Thank You to Gareth Stack for allowing me to use his photos! This entry was posted in Playing The Waterphone, Uncategorized. Bookmark the permalink.